So today I managed to make the dairy/gluten/taste-free (just kidding, it’s actually good!) macaroni and cheese, the mashed potatoes, the chocolate-dipped macaroons, and the from-scratch, dairy-free chocolate cream pie. That’s a big chunk of my portion of food to make, so I’m pretty pleased about that. All that’s left tomorrow are the roasted brussels sprouts and bacon. Easy! The food situation seems to be under control. 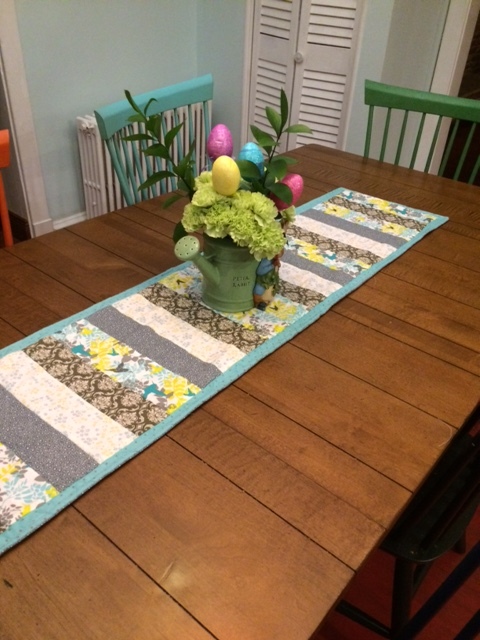 I had great aspirations of making place mats for each seat at the table, but I ran out of time. 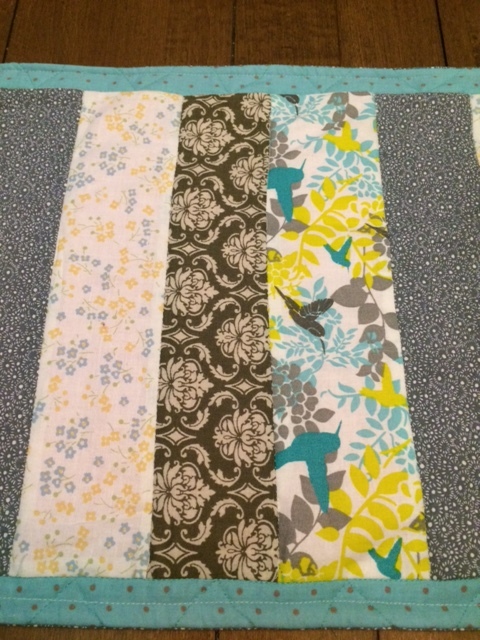 Remember in the last post that I mentioned that I yanked something from the “wall of the unfinished” that I intended to turn into a table runner? Well, that’s what happened this evening. That was quite a bear. My first machine snapped the belt and I couldn’t get the staple to go through the leather. So I moved to my trusty 66. Apparently, she’s ticked off at me for using the 15 w/ the jazzy reverse, because she is intent on making a bird’s nest on the underside of everything that she touches these days. Just wanting to get to bed, I decided to pull out A.S.’s 99 handcrank. Besides my feet flying all over the place like I was on a make-believe treadle, things went pretty smoothly. I will say, though, that there is some serious skill in sewing with one hand while the other one cranks. And, surprise, surprise, that’s a skill I don’t have! Alas, the runner is done. That’s what counts, I guess. Like pretty much everything I make, I’m not super happy with it. It’s got more waves in it than the Atlantic Ocean in a coastal storm! But it’s done and I am thankful. Plus, with that out of the way, I could do the fun stuff! In our house, the story goes that E.B. 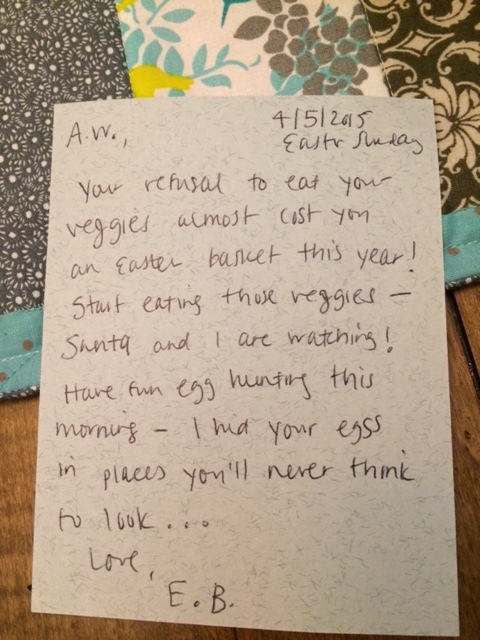 (the Easter bunny) and Santa are close pals. They hang out all the time and talk about who’s naughty or nice and who’s sassy or sweet. Santa spilled the beans a long time ago to E.B. that you can get into good little boys’ and girls’ houses by hitching a ride down their chimneys while they snooze. E.B. couldn’t compete with Santa’s gifts, but he could do Easter baskets. And so it goes. 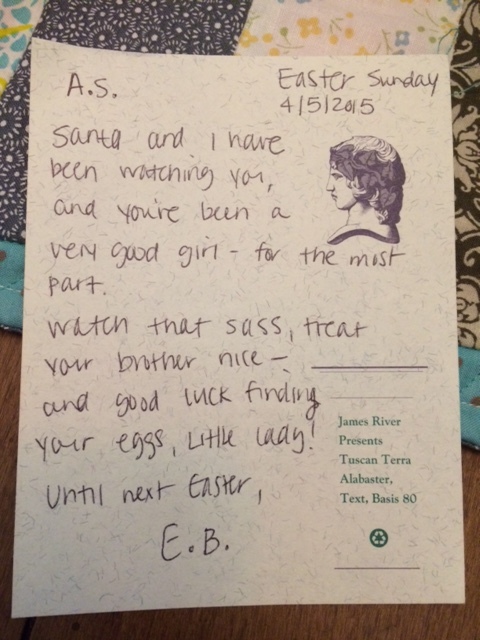 Of course, Santa told E.B. that he gets cookies to munch on when he drops off his gifts. E.B. decided, at least at our house, that he wanted to play a game with us. 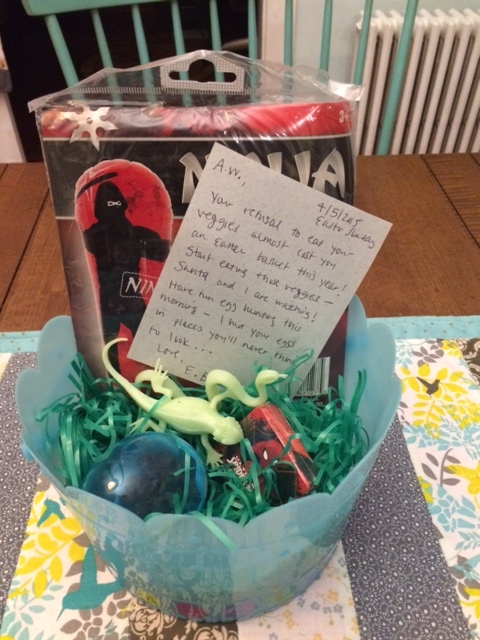 He leaves us a basket and a note for the littles. After that, he goes in our fridge and scopes out how we designed our eggs. He is a little stinker, and he makes off with our eggs, only to hide them in silly places outside in the yard and garden. A.S. and A.W. love to find out what crazy places E.B. put their eggs for them to find on Easter morning! 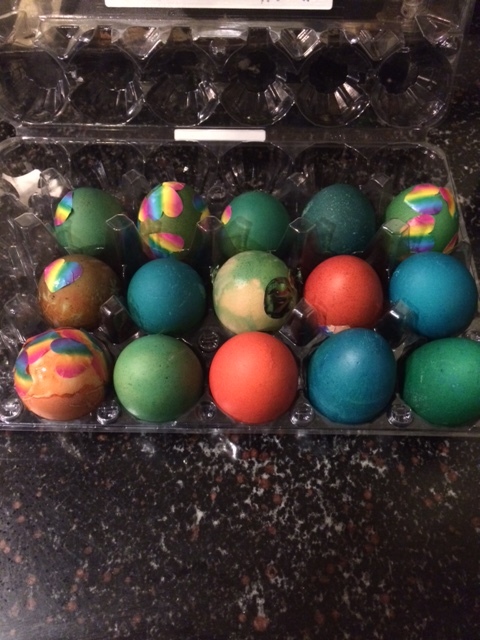 And speaking of egg decorating, this year we did the vinegar and food coloring dye. In the past, we have just done stickers to make it easy for little hands. From now on, we will do it this way. The kids had a blast with this! 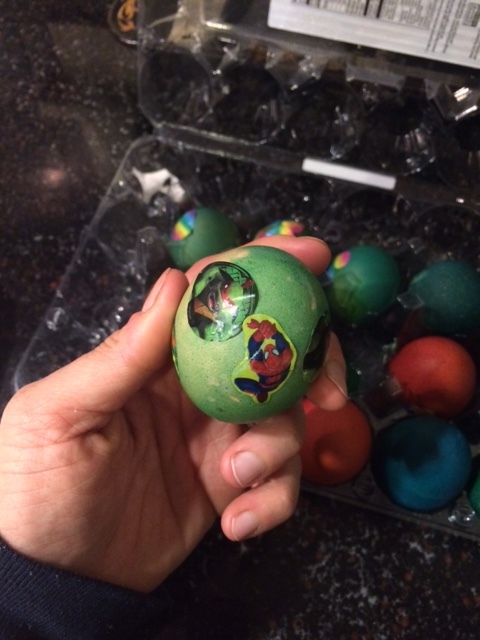 Of course they have a favorite egg. And since this is something I hope they can go back and read someday, I have to put pictures of the best of the best here. And before I go to bed myself, I want to share some pics of the kids’ baskets. They were great finds at the local Dollar Tree, and A.S.’s can be used as a little baby doll carrier when she’s done with it. She will love that. 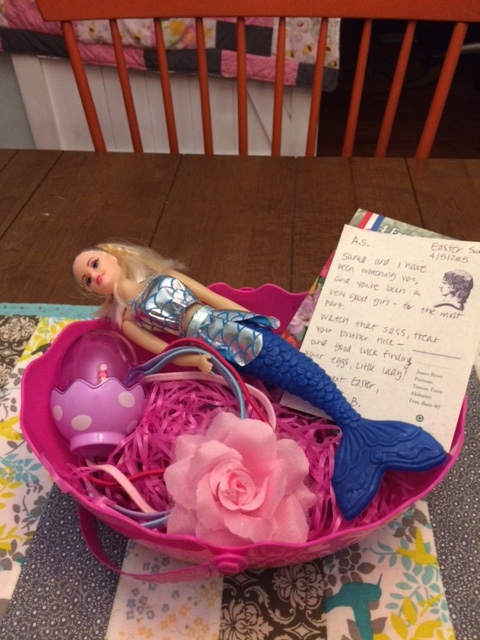 She’s also got some headbands and a mermaid imitation Barbie that she’ll get a kick out of. A.W. is getting a couple glow-in-the-dark lizard things and a blow-up punching bag since he thinks he’s a little ninja turtle. As I do on every holiday evening, I’m going to go upstairs, get a quick shower, hop in bed, and not sleep because I’m so giddy about their egg hunt in the morning! Being a mom (usually) rocks! 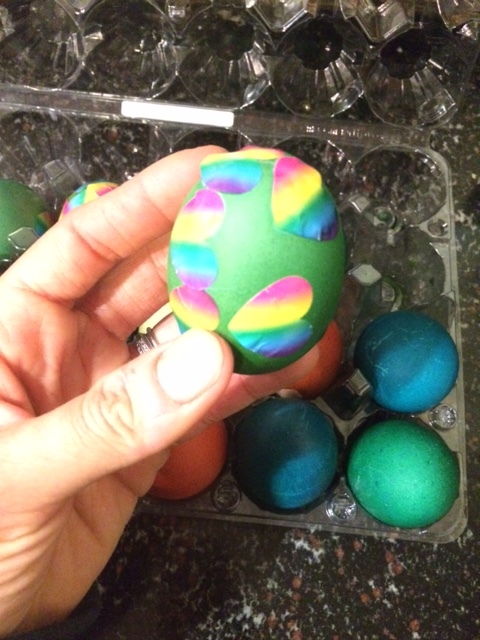 Happy Easter and/or Passover to all! < Previous Spring, I Hope You’re Real! Next > Say No, Thank You, to Cavities With Homemade, Two-Ingredient Toothpaste!